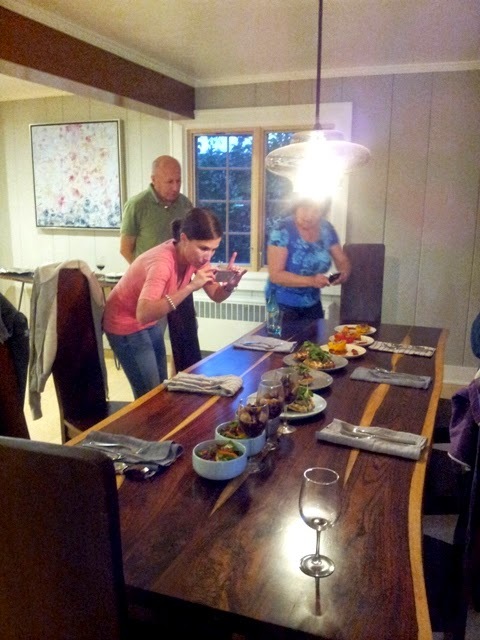 This past weekend, my family and I spent a most relaxing time in the Berkshires near Great Barrington. In honor of my mom's 60th birthday, we rented a lovely house in the area and spent the whole weekend chillin, cooking, enjoy the outdoors and each other's company. Dan and I were lucky enough to score the second batch, which made way for great opportunities to make something hearty, comforting but also sophisticated. I have to say that everyone pulled out the stops and all of the dishes were a huge success. Even though we tried to be discerning in our judging process, we ended up loving everything and congratulated each other on a job well done. Here are the goodies that came out of this fantastic competition. I highly recommend doing this on a future family trip - it'll for sure bring you closer together! 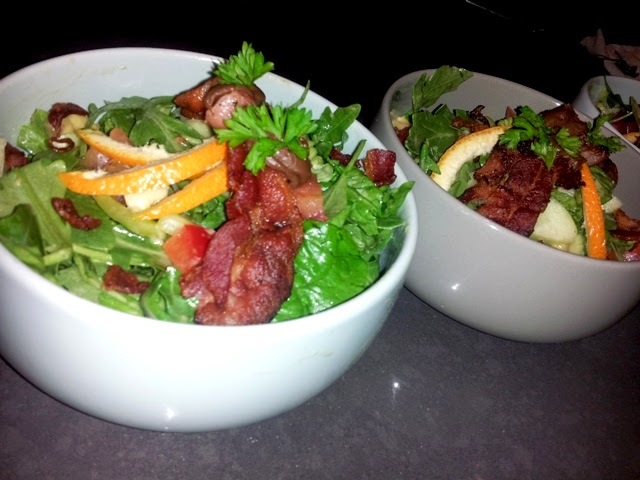 Citrus Salad with Bacon by Mira - Having the great idea of pairing the smoky bacon with something healthy such as fresh vegetables, my mom went all out. While the dish may look simple, she incorporated a very diabolical strategy of glazing the bacon in Nutella, which surprised and delighted us all. Nutella Parfait by Paul - Being the master of parfaits, my dad accentuated Nutella as the star ingredient by mixing it with yogurt, fresh fruit and some crunchy oat cereal. Not only did he put his concoction in festive wine glasses, he cut out the fruit in a zig-zag design, which added a special touch. 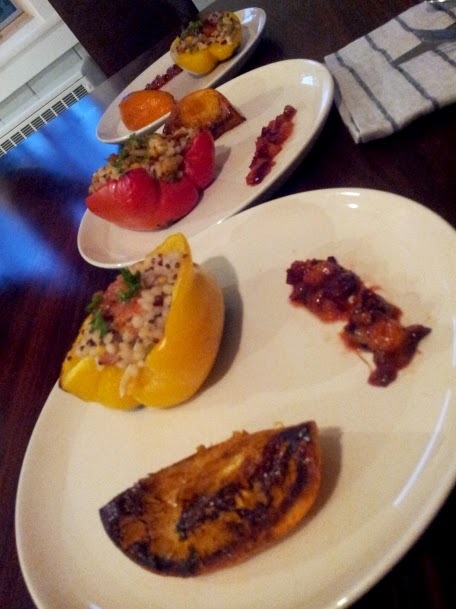 Stuffed Peppers with Grilled Oranges by Peter and Fiana - Deciding to make something healthy, each bite of this stuffed pepper with a cous-cous/quinoa medley stuffing tasted wholesome. We loved all the different colors represented, including a mix of red and yellow peppers. A side of a sweet plumb reduction was a great idea for a natural sweetener, as well as the clever use of grilled oranges, that would also go nicely on top of a salad. A Modern take on Chicken and Waffles by Dan and Fooditka - Doing what we do best, Dan and I decided to make waffles. 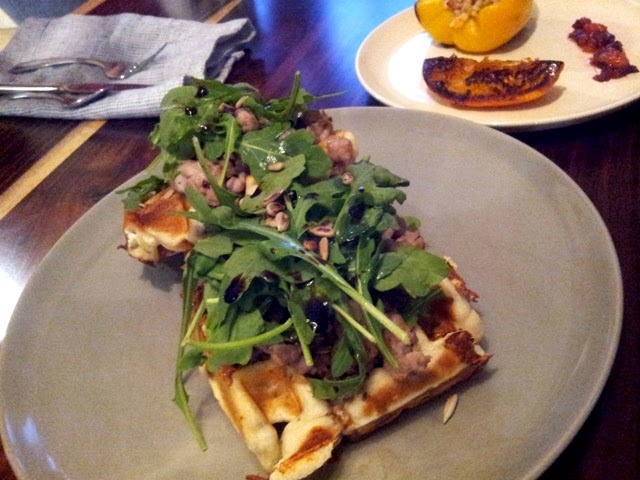 Using lean chicken sausage as the star ingredient, we sauteed it over some red onions and then topped each homemade sunflower seed waffle with it, as well as a generous amount of the porcini truffle cream. A big handful of arugula sprinkled with the pomegranate balsamic went on top for more goodness.